The film opened with mass hangings of men, women, and even children - anyone suspected of associating with pirates, orchestrated by evil Lord Cutler Beckett (Tom Hollander) of the East India Trading Company (EITC). 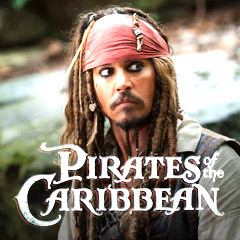 Elizabeth Swann (Keira Knightley), Captain Barbossa (Geoffrey Rush), the crew of the Black Pearl and others journeyed to Singapore to bargain with fearsome South China Sea pirate Captain Sao Feng (Chow Yun-Fat) of The Empress for a navigational chart - to help them find the gateway to Davy Jones' Locker called World's End, so that they could rescue eternally-trapped Captain Jack Sparrow (Johnny Depp), pirate lord of the Caribbean. The group fled when attacked by the British Royal Navy searching for pirates. Barbossa led them to the edge of the world and over a giant waterfall to find Jack - who was in the afterlife, stranded with his Black Pearl in the middle of a desert. He was suffering from schizophrenic-like, multiple hallucinations of himself. Using the locomotive power of thousands of crabs, the Black Pearl was carried to the beachside where Jack was rescued, but the group seemed eternally trapped. Elizabeth saw her father Governor Swann (Jonathan Pryce) as one of many dead souls floating by in a boat, executed by Beckett. When Jack deciphered a clue on the map ("Up is down") and the Pearl was overturned by rocking it upside down, they returned to the real world at sunrise (marked by a green flash). A Brethren Court gathering was to be held with Jack (possessing one of 9 pieces of eight) and eight other pirate lords at Shipwreck Cove where the nine pirate lords met in a supreme council to plan to join in battle against threatening Lord Cutler Beckett who was increasing his monopolistic power within the EITC. Beckett had captured tentacled Davy Jones' heart and kept it in a chest, trapping him into his service and using his power (over the world's oceans and Seven Seas) and Jones' ghost ship The Flying Dutchman to further extinguish piracy. Meanwhile, Will Turner (Orlando Bloom) revealed his real objective - to acquire the Black Pearl and free his cursed father "Bootstrap Bill" (Stellan Skarsgard) from Davy Jones' (Bill Nighy) Flying Dutchman, although Will was betrayed by Sao Feng who took Elizabeth away on the Pearl. Barbossa described how the Sea Goddess Calypso (Naomie Harris) and her "power of the sea" could be released to aid them in the coming battle against the British ships. There were a number of back-stabbing double-crosses, empty promises, and changing allegiances too complex to detail. Sao Feng was killed when the British fleet (allied with Davy Jones) unexpectedly attacked, and as he died he appointed Elizabeth as his pirate lord replacement - and as the new Captain of the Pearl - he died mistakenly believing that she was Calypso. Admiral James Norrington (Jack Davenport), Elizabeth's former fiancee, freed her and her crew from imprisonment in the Dutchman, but he lost his life when killed by "Bootstrap Bill". At Shipwreck Cove during the Brethren Court meeting of the nine pirate lords (including a surprise appearance by Jack's father Captain Teague (Keith Richards), Keeper of the Pirata Codex), she was elected Pirate King by popular vote when Sparrow cast his one vote for her ("Curious, isn't it?") and she ordered all-out war ("We're at war") against Cutler Beckett and his British ships. At the same time, both Barbossa and Davy Jones were attempting to unleash the powers of Calypso, Jones’ volatile love (the reason he cut out his own heart), for their own purposes - she had been imprisoned by the nine pirate lords in the body of priestess Tia Dalma (Naomie Harris). At the start of the battle with the British fleet, Calpyso (on board the Pearl) was freed from her "human bonds" by Barbossa (who had collected all the pirate lords' pieces of eight and then performed a ritual) - grew to gigantic size, and unleashed a violent whirlpool, rain and windstorm. Simultaneously, Sparrow (again with multiple personalities) - who had been traded and was captive in The Flying Dutchman, escaped from his jail cell, stole the Dead Man's Chest, and obtained its key from Jones during a sword duel atop a ship's sail. During the violent sea battle, Will was married to Elizabeth on the deck amidst rain and swordfights, but he was mortally stabbed by Davy Jones - although Sparrow was able to stab Jones' heart and kill him (using Will's hand, in order to have Will become his replacement as the Flying Dutchman's immortal captain) - and Jones fell into the maelstrom's whirlpool to his death. Elizabeth and Jack escaped as Will's heart was cut out of his body by his father and placed in the chest. Will was reborn and became the new captain of the resurrected Dutchman - and he, with Jack and Barbossa (on the Pearl), defeated Beckett and killed him (his last words: "It's just good business") by sinking the Endeavor (by surrounding it on both sides with cannon-fire) and causing the rest of the fleet to sail away. Will was then destined to sail as captain of the Dutchman (with his father) for eternity - he made love to Elizabeth (now Mrs. Turner) on his one day in 10 years allowed on land before saying goodbye and departing, and they promised to see each other again in a decade. Elizabeth promised to keep Will's beating heart safe in the chest ("It's always belonged to you"). Barbossa and his crew sailed away on the Pearl to search for Ponce de Leon's Fountain of Youth (although Jack, who was left behind, had the most crucial, middle part of the map). In the last scene, Jack was seen in a small dinghy with his piece of the map, using his magical compass to navigate for the Fountain. At the conclusion of the end credits - exactly ten years later, Elizabeth - who had raised a son (named Will), stood on a cliffside with him and saw her husband Will returning on the Dutchman, sailing toward them after the sunset's green flash. With a production budget of $300 million - the most expensive film ever to produce, to date. The film grossed $309 million (domestic) and $961 million (worldwide). Nominated for two Academy Awards (with no wins): Best Makeup and Best Visual Effects. Set-pieces: the multiple-Jacks sequences, the climactic sea battle.